The Korean Music Copyright Association (KOMCA) maintains the official list of music copyrighted in Korea. Music companies usually send the songs' official writer copyright information to KOMCA before release. Here's a list of all the idols (that I know of so far), the # of songs, the list of songs, and their songwriting involvement that are credited by the Korean Music Copyright Association (KOMCA). Bekah (W1051000)(BEKA) - 5 Copyrighted Songs. 5 Lyrics Credits. Kahi (W1050900) - 3 Copyrighted Songs. 3 Lyrics Credits. Raina (10000887)(RE I NA) - 2 Copyrighted Songs. 2 Lyrics Credits. Jimin (10005507) 1 Copyrighted Song. 1 Lyrics Credit. Chorong (10003109)(PARK CHO RONG) - 1 Copyrighted Song. 1 Lyrics Credit. BARO (10001318)(CHA SUN WOO) - 30 Copyrighted Songs. 26 Lyrics Credits. 2 Composition Credits. Jinyoung (10001319)(JIN YEONG)(JEONG JIN YOUNG) - 19 Copyrighted Songs. 17 Composition Credits. 17 Lyrics Credits. 8 Arrangement Credits. CNU (10001977)(SIN U)(SHIN DONG WOO) - 9 Copyrighted Songs. 8 Lyrics Credits. 3 Composition Credits. BANG YONG GUK (W0849100)(BANG YONG KUK)(JEPP BLACKMAN) - 52 Copyrighted Songs. 5 Lyrics Credits. 8 Composition Credits. 2 Arrangement Credits. RAP MONSTER (10003681)(THE RAP MONSTER) 16 Copyrighted Songs. 16 Lyrics Credits. 14 Composition Credits. SUGA (10005239) 12 Copyrighted Songs. 12 Lyrics Credits. 11 Composition Credits. J-HOPE (10003800)(HO SEOK JEONG) 11 Copyrighted Songs. 11 Lyrics Credits. 10 Composition Credits. V (10005240) 1 Copyrighted Songs. 1 Lyrics Credit. JIMIN (10005241) 1 Copyrighted Songs. 1 Lyrics Credit. JUNG KOOK (10005242) 1 Copyrighted Songs. Lyrics Credit. JIN (10005243) 1 Copyrighted Songs. Lyrics Credit. Junhyung (W1041800)(YONG JUN HYUNG)(I-003154634-4) - 63 Copyrighted Songs. 63 Lyrics Credits. 27 Composition Credits. 11 Arrangement Credits. Doojoon (W1041600)(YOON DU JUN) - 3 Copyrighted Songs. 3 Lyrics Credits. Hyunseung (W1041700)(JANG HYUN SEUNG) - 3 Copyrighted Songs. 3 Lyrics Credits. Yoseob (W1041900)(YANG YO SEOP) - 3 Copyrighted Songs. 3 Lyrics Credits. Kikwang (W1042000)(LEE GI KWANG) - 3 Copyrighted Songs. 3 Lyrics Credits. Dongwoon (W1042100)(SON DONG WOON) - 3 Copyrighted Songs. 3 Lyrics Credits. G-Dragon (W0726200)(KWON JI YONG) - 144 Copyrighted Songs. 144 Lyrics Credits. 101 Composition Credits. 8 Arrangement Credits. T.O.P (W0726300)(CHOI SEUNG HYUN) - 45 Copyrighted Songs. 44 Lyrics Credits. 13 Composition Credits. Seungri (W0726500)(LEE SEUNG HYUN) - 19 Copyrighted Songs. 19 Lyrics Credits. 13 Composition Credits. 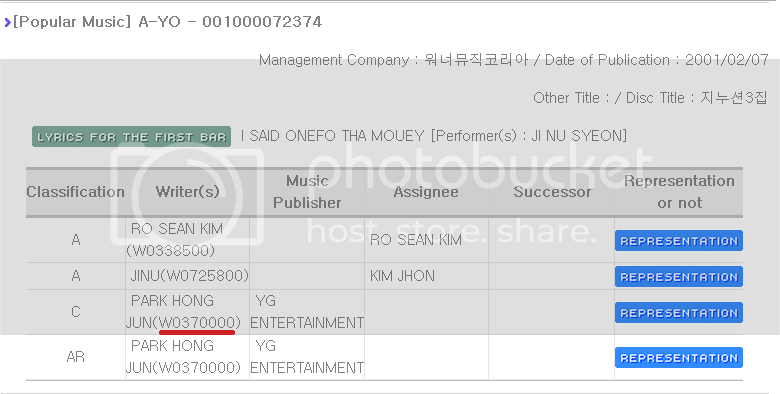 TaeYang (W0726100)(DONG YOUNG BAE) - 18 Copyrighted Songs. 12 Lyrics Credits. 10 Composition Credits. Daesung (W0726400)(KANG DAE SUNG) - 11 Copyrighted Songs. 11 Lyrics Credits. 1 Composition Credit. Zico (10000005)(WOO JI HO) - 53 Copyrighted Songs. 47 Lyrics Credits. 21 Composition Credits. 2 Arrangement Credits. Kyung (10000004)(PARK KYUNG) - 31 Copyrighted Songs. 31 Lyrics Credits. 3 Composition Credits. P.O (10002204) - 4 Copyrighted Songs. 4 Lyrics Credits. Romantically (Dreams Come True) - co-written by Zico, P.O. Mega Yak ft. P.O of Block B (DELIGHT) - co-written by P.O. BURN OUT (Phantom OST) - co-written by P.O. BoA (W0438400)(KWON BO A) 38 Copyrighted Songs. 36 Lyrics Credits. 15 Composition Credits. MIRYO (W0576100)(MI RYO)(CHO MI HYE) - 67 Copyrighted Songs. 67 Lyrics Credits. JeA (W0759700)(JE A) - 19 Copyrighted Songs. 18 Composition Credits. 5 Lyrics Credits. BROWN EYED GIRLS (W0576100) - 1 Copyrighted Song. 1 Lyrics Credit. Ilhoon (10003014)(JUNG ILHOON) - 6 Copyrighted Songs. 6 Lyrics Credits. Minhyuk (10003013)(LEE MINHYUK) - 2 Copyrighted Songs. 2 Lyrics Credits. Yonghwa (W1025300)(JUNG YONG HWA)(JEONG YONG HWA) - 40 Copyrighted Songs. 36 Composition Credits. 30 Lyrics Credits. 6 Arrangement Credits. Jonghyun (10001228)(LEE JONG HYUN) - 17 Copyrighted Songs. 17 Composition Credits. 6 Lyrics Credit. Minhyuk (KANG MIN HYUK)(KANG MIN HYEOK) - 1 Copyrighted Song. 1 Lyrics Credit. CNBLUE - 1 Copyrighted Song. 1 Lyrics Credit. RE DEE (10002933) - 2 Copyrighted Songs. 2 Lyrics Credits. Junsu (W0683200)(KIM JUN SOO)(XIAH) - 25 Copyrighted Songs. 22 Composition Credits. 15 Lyrics Credits. Yoochun (W0669700)(PARK YU CHUN)(MICKY)(MIG KHI YU CHEON) - 19 Copyrighted Songs. 14 Composition Credits. 14 Lyrics Credits. 2 Arrangement Credits. Yunho (W0735800)(U-KNOW) - 6 Copyrighted Songs. 2 Composing Credits. 2 Lyrics Credits. 2 Arrangement Credits. Changmin (W0843900)(MAX) - 4 Copyrighted Songs. 4 Lyrics Credits. Jucy (10003632)(EVOL 3) - 7 Copyrighted Songs. 7 Lyrics Credits. Say (10003631)(EVOL 1) - 2 Copyrighted Songs. 2 Lyrics Credits. EVOL 4 (10003628) - 1 Copyrighted Song. 1 Lyrics Credit. EVOL 5 (10003629) - 1 Copyrighted Song. 1 Lyrics Credit. EVOL 2 (10003630) - 1 Copyrighted Song. 1 Lyrics Credit. LE (10002393). 14 Copyrighted Songs. 14 Lyrics Credits. 2 Composition Credits. Sojin (10003147)(SO JIN) 5 Copyrighted Songs. 5 Lyrics Credits. 3 Composition Credits. Yuri (10000649)(KWON YU RI) - 2 Copyrighted Songs. 2 Lyrics Credits. Sooyoung (10002976)(CHOI SOO YOUNG) - 2 Copyrighted Songs. 2 Lyrics Credits. TIFFANY (10003061) - 3 Copyrighted Songs. 3 Lyrics Credits. Seohyun (10004689)(SEO JU HYUN) - 1 Copyrighted Song. 1 Lyrics Credit. G.NA (10001960)(CHOI GINA) 7 Copyrighted Songs. 6 Lyrics Credits. 2 Composition Credits. IU (10000992)(A I YU) 14 Copyrighted Songs. 14 Lyrics Credits. 6 Composition Credits. Jay Park (10000556)(BAG JAI BEOM) 40 Copyrighted Songs. 39 Lyrics Credits. 16 Composition Credits. JUNIEL (10003338). 11 Copyrighted Songs. 11 Composition Credits. 11 Lyrics Credits. Seungyeon (10004323)(HAN SEUNG YEON) - 1 Copyrighted Song. 1 Lyrics Credit. Gyuri (10004321)(PARK GYU RI) - 1 Copyrighted Song. 1 Lyrics Credit. NICOLE (10004319) - 1 Copyrighted Song. 1 Lyrics Credit. Goo Hara (10004322)(GU HA RA) - 1 Copyrighted Song. 1 Lyrics Credit. Jiyoung (10004320)(KANG JI YOUNG) - 1 Copyrighted Song. 1 Lyrics Credit. Lee Hyori (W0431700) (LEE HYO LEE) 33 Copyrighted Songs. 33 Lyrics Credits. 4 Composition Credits. SAM (10004643) 17 Copyrighted Songs. 13 Composition Credits. 11 Lyrics Credits. TEO (10004641) 13 Copyrighted Songs. 13 Composition Credits. YUN(10004642) 13 Copyrighted Songs. 13 Composition Credits. Mir (10000866)(MI REU) - 11 Copyrighted Songs. 11 Lyrics Credits. G.O (W0700300)(JANG GOON) - 9 Copyrighted Songs. 9 Lyrics Credits. 7 Composition Credits. 2 Arrangement Credits. Thunder (10001045)(CHEON DUNG)(PARK SANG HYUN) - 5 Copyrighted Songs. 5 Composition Credits. 5 Lyrics Credits. Seungho (10000867) - 1 Copyrighted Song. 1 Composition Credit. Foolish Me (BA BO GATH EUN NA) (G.O & Mir for Iris 2 OST) - co-composed, co-arranged by G.O, co-written by Mir, G.O. ZINGER (JING GEO)(10001566) - 11 Copyrighted Songs. 11 Lyrics Credits. Jonghyun (10000434)(KIM JONG HYUN) - 11 Copyrighted Songs. 11 Lyrics Credits. 2 Composition Credits. MINHO (W1052100)(CHOI MIN HO) - 2 Copyrighted Songs. 2 Lyrics Credits. KEY (W1052000)(KIM KI BUM) - 2 Copyrighted Songs. 2 Lyrics Credits. ONEW (10000435) - 1 Copyrighted Song. 1 Lyrics Credit. Hyorin (10005210)(HYO RIN) 1 Copyrighted Song. 1 Lyrics Credit. Boa (W0880300)(KIM BO A) - 17 Copyrighted Songs. 17 Lyrics Credits. 2 Composition Credits. Bohyung (10002719) 2 Copyrighted Songs. 2 Composition Credits. 2 Lyrics Credits. 1 Arrangement Credit. Donghae (W0805800) - 15 Copyrighted Songs. 14 Lyrics Credits. 11 Composition Credits. 1 Arrangement Credit. HENRY LAU (10002950) - 10 Copyrighted Songs. 10 Composition Credits. 2 Lyrics Credits. 1 Arrangement Credit. LEE TEUK (W0805500) - 10 Copyrighted Songs. 8 Lyrics Credits. 5 Composition Credits. Eunhyuk (W0805700)(LEE HYUK JAE) - 9 Copyrighted Songs. 9 Lyrics Credits. Heechul (W1054900)(KIM HEE CHEL)(HEENIM)(U JU DAI SEU THA) 7 Copyrighted Songs. 7 Lyrics Credits. ZHOUMI (Z0502051) - 5 Copyrighted Songs. 5 Lyrics Credits. 1 Composition Credit. SUNGMIN (W0805600) - 5 Copyrighted Songs. 5 Lyrics Credits. 1 Composition Credit. RYEOWOOK (W0937900) - 1 Copyrighted Song. 1 Lyrics Credit. 1 Composition Credit. KANG IN (W0992400) 1 Copyrighted Song. 1 Lyrics Credit. Shindong (10002521)(SIN DONG) 1 Copyrighted Song. 1 Lyrics Credit. My Everything (Henry) - Composed, Arranged, Written by NoizeBank [Henry Lau/Gen Neo/Neil Nallas /Issac Han]. Ready 2 Love (Henry) - Composed, Arranged by NoizeBank [Henry Lau/Gen Neo/Issac Han]. Lyrics co-written by Henry Lau. AJ (10001256) (JAESEOP KIM) 11 Copyrighted Songs. 11 Lyrics Credits. 4 Composition Credits. RAVI (10003665) 12 Copyrighted Songs. 12 Lyrics Credits. 2 Composition Credits. Yenny (W1020800)(PARK YE EUN) - 8 Copyrighted Songs. 7 Composition Credits. 6 Lyrics Credits. 2 Arrangement Credits. Yubin (Z0502491)(YU BIN) - 2 Copyrighted Songs. 2 Lyrics Credits. Jinwoon (10001741)(JEONG JIN WOON) 4 Copyrighted Songs. 4 Composition Credits. 4 Lyrics Credits. Changmin (10003509)(LEE CHANG MIN) - 4 Copyrighted Songs. 4 Lyrics Credits. 3 Composition Credits. Jo Kwon (W1021600) - 3 Copyrighted Songs. 2 Lyrics Credits. 1 Composition Credit. CL (W0982500) - 3 Copyrighted Songs. 3 Lyrics Credits. Junho (W1064800)(LEE JUN HO) - 15 Copyrighted Songs. 14 Composition Credits. 12 Lyrics Credits. 1 Arrangement Credit. Jun.K (10000911)(JUN SU)(JUN SU KIM) - 12 Copyrighted Songs. 12 Composition Credits. 11 Lyrics Credits. 1 Arrangement Credit. Taecyeon (10003503)(OK TAEK YEON)(OG THAIG YEON) - 11 Copyrighted Songs. 11 Lyrics Credits. 7 Composition Credits. HyunA (10000727)(HYEON A) 6 Copyrighted Songs. 6 Lyrics Credits. 1 Composition Credit. Jiyoon (W1042200)(JEON JI YOON) - 2 Copyrighted Songs. 2 Lyrics Credits. 1 Composition Credit. 1 Arrangement Credit. Q: How do you order the List? There is no official way songwriting credits are generally ordered, and due to various factors the order may be misleading or imperfect. If you have any complaints or suggestions about how the groups, songs, or members are ordered, feel free to leave a comment. Q: How do you calculate the credits? "1 Copyrighted Song. 1 Lyrics Credit. 1 Composition Credit. 1 Arrangement Credit." Q: How do you determine the Writer's degree of involvement in songwriting? the Idols' Credit involvement for the song will be listed as "Composed" "Written" "Arranged" ("by [Idol A], [Idol B], [Idol C]..."). the Idol's Credit involvement in that group category will be listed as "Co-composed" "Co-written" or "Co-arranged" ("by [Idol A], [Idol B], [Idol C]..."). Q: How do you find songwriting credits on KOMCA? A: Go to the Works Search (linked at the top of the thread). As you can see here, the songs' titles are often listed under the romanization of their Korean names. Because of that, it is often easier to find the song by searching under Performers. Q: How do you read the credit classification? Q: Why do you need the Writer ID #, not just the writer's Name? As you can see, the SAME Writer can be listed under different Names (Stage Name, 2nd Stage Name, Stage Name with different spelling, Real Name, etc...) This often makes searches by name inaccurate. To make this process simpler, the most efficient way to find all the Writers' credited Works is to search by Writer ID #. To do this just Copy+Paste the Writer ID # into the "Writers(s)" category in the Works Search. Interesting list, thank you for the compilation. When I see co-write linked to the rappers in the group, it usually means they wrote their rap verses right? 4Minute and BTOB should definitely be on here if A Pink is. Thanks for the list. So Tiffany wrote the awesome rap part in the live version of Genie? also what about Jay Park? Yes she did. As well as The Boys English Rap/Bridge (which was the only part that made sense). Np! Do you have any idea which songs they wrote? Do you guys think I should? I've checked multiple times, but unfortunately Dal Shabet isn't OFFICIALLY credited under any of their new works on their new album.